BARE International is celebrating its 30th Anniversary of being a leader in the customer experience research industry. The award was presented by the Mystery Shopping Providers Association (MSPA Americas) after having received thousands of nominations from Professional Mystery Evaluators nationwide to discover their preferred Mystery Shop Provider. I found BARE to be a professional and honest company that treats its shoppers with respect. 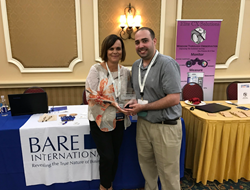 Bare International is the recipient of the 2017 Shopper’s Choice Award. In 2017, BARE International celebrates 30 years of supporting businesses worldwide in creating excellent customer experiences. MSPA Americas (formerly known as the Mystery Shopping Providers Association of North America) is the trade association representing the customer experience industry throughout the Americas, founded to strengthen the customer service industry and provide timely, actionable and impactful resources for shaping the future of business communities. The Shopper’s Choice Award was created to allow Independent Contractor members to vote on their favorite Mystery Shop Provider. Dale Bare, CEO, Jason Bare, Global Business Development Manager, Guy Caron, Vice-President, and Michele Lawlor, Project Manager were in attendance to accept the award at the Annual ShopperFest Event in Orlando, Florida. “BARE currently partners with a wide range of industries that provides great opportunities for our evaluators – everything from dining experiences to baseball games to overnight hotel stays. As we continue to grow, we are always looking to expand our database of enthusiastic evaluators,” states Jason. For interest in becoming a BARE Evaluator, please visit http://www.bareinternational.com/evaluators for more information.